Kay Carswell and Chad Riley welcome Author, Mark Combs back to Deception Detection Radio. They take up where they left off in Mark's last interview with them. Mark shares some new updates his research has uncovered. He also has much more to share. Join Kay, Chad and Mark on this journey of discovery. 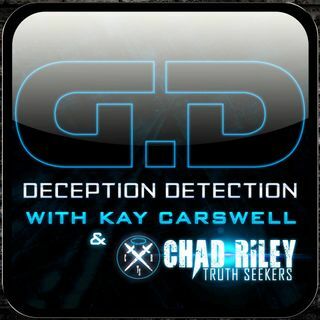 Kay Carswell and Chad Riley welcome Author, Mark Combs back to Deception Detection Radio. They take up where they left off in Mark's last interview with them. Mark shares some new ... See More updates his research has uncovered. He also has much more to share. So grab your Bible, coffee, kick back in your favorite chair and join Kay, Chad and Mark on this journey of discovery. If you enjoyed tonight's interview, please, like, share and subscribe. Deception Detection Radio can be heard on IHEARTRADIO. ITunes, YouTube, Spreaker, Podkicker, Instagram, Twitter, Google+, FaceBook and much more. If you would like to contact Kay directly, you can write her at DeceptionDetectionRadio@yahoo. com or on FaceBook. If you would like to contact Chad directly, you can write him at DeceptionDetectionRadioChadRiley@Yahoo.com or on FaceBook by his name or in Truthseekers Research. Thank you all for listening! May God bless each and every one of you!